The treatment process consists of a series of steps. 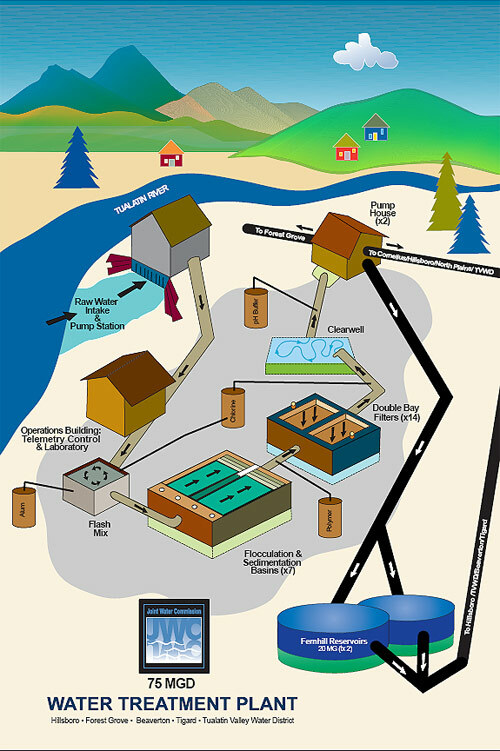 First, raw or untreated water is drawn from the upper-Tualatin River Intake and pumped directly to a mixing tank where chlorine and alum are added. The chlorine serves as a disinfectant and the alum causes small particles to rapidly “floc” or adhere to one another, making them heavy enough to settle out of the water in a sediment basin. Activated carbon is also periodically added in this process when needed to remove irregular taste and odor constituents. After settling, polymer is added to remove turbidity, a common measure of the clarity of water. The water is then filtered through layers of fine coal and silicate sand. As suspended particles are removed, turbidity disappears and clear water emerges. Removing turbidity is the best protection against Cryptosporidium, since the cysts containing the Cryptosporidium are also removed in the filtering process. At this point, the lowest quantity necessary of Chlorine is added as a precaution against any bacteria that may still be present. We carefully monitor the amount of chlorine, adding the lowest quantity necessary to protect the safety of your water without compromising taste. Finally, caustic soda is added to adjust the final pH and alkalinity. The treated or “finished water” is then temporarily stored in an underground water storage reservoir or clearwell allowing the chlorine to fully disinfect the water. Finally, the finished water is pumped from clearwell storage to either the Fernhill Reservoirs or directly into a transmission line to be fed to one of the JWC member agencies or wholesale customers.